Clockify is the only 100% free time tracking software. It's a simple time tracker and timesheet app that lets you and your team track work hours on projects. Unlimited users, free forever. 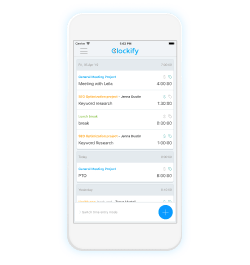 Clockify is a simple time tracker and timesheet app for tracking productivity, attendance, billable hours, and payroll. Clockify works across devices. Track time from your phone or desktop computer and continue online from any browser. Track time you spend working on activities, see exactly where the time goes, and improve your productivity. Track time on projects so you can see how much time projects really take and see if you charge enough. Mark time records as billable and Clockify will apply your hourly rates, so you can send reports to clients for review. Everyone on your team can log their time so you can track attendance and see who worked on what and how much at a glance. Clockify is the only 100% free time tracker and timesheet app for teams of all size. Clockify, unlike all the other time trackers, lets you have an unlimited number of users and projects for free. Other time tracking apps have free plans that limit you to 1 user (or 5 max). Clockify, on the other hand, lets you have as many people as you want. Clockify doesn't have any ads, sneaky upsells, limited trial periods, or anything like that. What you get when you sign up, that's free, forever. We created Clockify because our team needed a time tracker, but all the timekeeping apps were either too expensive or too complicated. 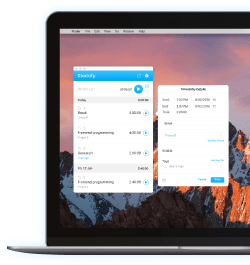 We believe that every team should have access to a simple time tracker without having to pay hundreds of dollars each month. That's why we offer Clockify for free to teams of all sizes. All the core time tracking features are free. If you want to extend Clockify with extra functionality, you can subscribe to one of our monthly plans. This helps us pay for infrastructure, support, and further development. We also offer self-hosting and development services to big teams and enterprises. This way, big companies get a great time tracking system that they can actually use, while others get to track time for free and in return help us improve Clockify. I own a software development company and we were spending $500 each month on a time tracking tool so all employees could log time. That's too much money for a simple time tracker. So we created Clockify. It has everything teams and companies really need, without costing a fortune. 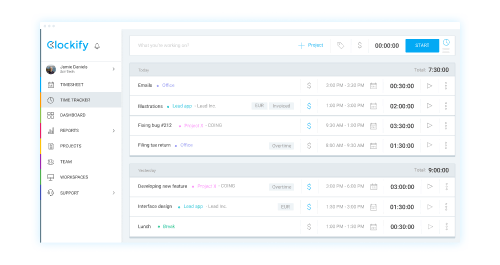 Extend Clockify with extra features so you can spend less time on managing your team's timesheets, and more on getting things done.